The CFHS speech team is preparing for Large Group All-State and Individual Events. 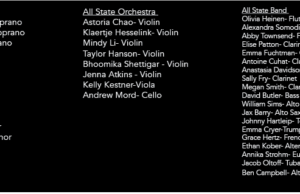 Large Group All-State will be at the Iowa State Center in Ames on Saturday, Feb. 18. The District Individual Contest is on Feb. 25. 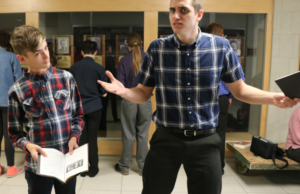 This year, choral reading will perform at the All-State Large Group Festival and improvisation team Bruess is invited, but will not perform. Meanwhile, the speech team is also practicing for the Individual District Contest. Where large group focuses on how each group works as an ensemble, individual events allow performers to develop distinct individual voice. 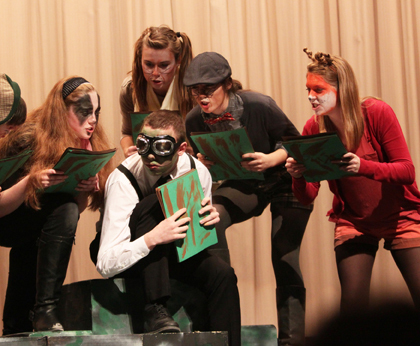 “Because IE [individual events] are solo performances, students can concentrate more on their own character development, diction, phrasing and ability to deliver a solid, one-person scene.” speech coach Rebecca Kauten said. Junior Jillian Ross agreed. “Individuals is a lot different than group. It’s focused on you, and there are a lot of events you can choose from,” Ross said. Like Ross noted, individual events have a wide variety of categories, many more than large group has. The categories are divided into memorized performances or performances without scripts like public address and improvisation, and pieces read from scripts like interpretive poetry and radio news broadcasting. Due to the wide variety of categories and the opportunities for individualizing pieces, individual speeches can have even more creative scripts than large group. For example, sophomore Noah Miller described one of his pieces for individuals. “I’m writing a speech for a group of people who are too obsessed with Star Wars and need help assimilating into normal society,” Miller said. After District Individuals Competition, those who earned a high scores will compete at State, then 300 performers statewide will be selected for All State. “CF can be proud of the fact that since 2003, we have had All State speech performers every year — and in both large group and IE events most years. Again, something to be very, very proud of,” Kauten said.